In this section are presented some excerpts of pieces for Paetzold and Live Electronics. The first we introduce is 4 variazioni sul ritmo del vento of Agostino Di Scipio, a piece for double bass Paetzold and electronics. There are two version of this piece one with Live Electronics and another with tape. The one presented is the first version which is possible to be executed with two different electronic systems: one version was realized with Kyma and the other with PureData. Even if the main process based on granular effect, which will be discussed below, is the same, the result differs a lot in terms of sound depending on the specific algorithms developed on the two softwares. In any case the composer considers both versions equally coherent. As we can see on the score there are two levels of technique performances for the player, in fact mouth and fingers are not considered as a singular interaction system but like two entities which can interact or not, producing many kind of sonic relationships. These many sonic possibilities needs then to be revealed trough the sound reinforcement and for this, as comes clear from the reading of the score, it's necessary to use a multi miking technique. If we look the score we can see that there are two lines for the player one for the fingers and one for the mouth, this because there are sounds directly combined with the fingers action and other with the air action and then some other produced by their combination. This means that there are more sounds that needs to be tracked instead of traditional emission, and in fact the composer suggests to use more then one microphone to amplified all the sounds. 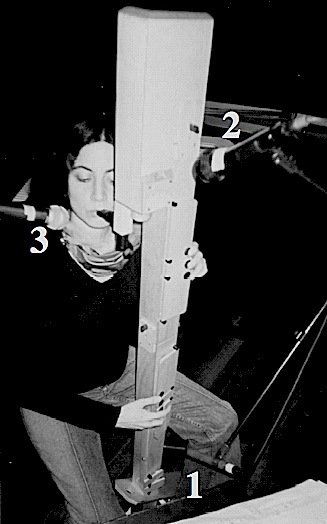 These particular microphones positions are not only used for an extended amplification of the written sounds but are also fundamental to record all the nuances with which the computer can interact with. We have introduced the fact that the electronic, in this piece, is based on the granulation process, which is involved to transform and to extend the granularity already present into the acoustic writing. Especially for what regards the key sounds it's evident that the noisy and fragmented sonic characteristics can be increased by a digital processing which is based on this concept. 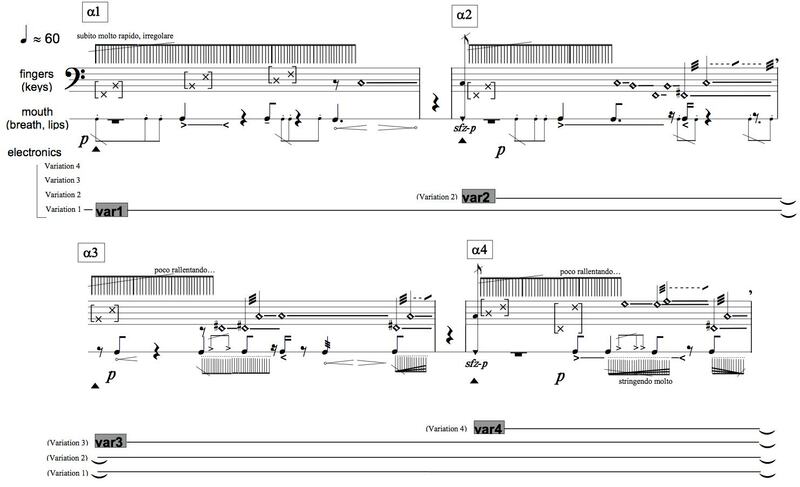 Below some fragments of the score with the relative recording in two version, the one named dry is without electronic and the named wet is with the realtime transformation.